Discussion in a House committee Tuesday on a proposed change to the name of a state holiday honoring soldiers who fought for the Confederacy took on an extra dose of notoriety because of the identity of the main proponent of the change. Discussion in a House committee Tuesday on a proposed change to the name of a state holiday honoring soldiers who fought for the Confederacy took on an extra dose of notoriety because of the identity of the main proponent of the change — a 13-year-old student from Austin named Jacob Hale. Hale came up with draft language to change the holiday to Civil War Remembrance Day and persuaded state Rep. Donna Howard, D-Austin, to carry the bill. But as befits this perpetually divisive topic, Hale's idea drew some heated opposition. When Howard, in response to criticism, insisted that the bill was not about political correctness or erasing history, she was mocked by audience members. Those who signed up to testify overwhelmingly opposed the bill, some saying Hale was too young or naïve to understand the impacts of what he was proposing. One committee member was compelled to interrupt the hearing to encourage Hale, telling him, "I don't want you to be affected by the comments you're hearing here today." The bill was left pending in committee. UT Must Tussle With Outsiders for Strong and Smart Trademarks, by Matthew Watkins — The University of Texas filed for five trademarks related to the hiring of basketball coach Shaka Smart this month. But an alumnus, his neighbor and a Louisiana company beat it to the punch on three others. John Legend Targets Texas Incarceration Rates, by Alexa Ura — Ahead of a trip to Texas to advocate for an end to mass incarceration, the Grammy and Academy Award-winning singer talks with The Texas Tribune about why the state is so crucial to the criminal justice reform movement. Business Groups Praise House Sales Tax Cut Plan, by Aman Batheja — The House Ways and Means Committee heard mostly praise for Chairman Dennis Bonnen's plan to cut the state's sales tax and the business margins tax. Lt. Gov. Dan Patrick said the Senate remains committed to a property tax cut. Castro Asks Feds for Border Surge Details, by Julián Aguilar — A Democratic congressman has asked the federal government to do what the Texas Department of Public Safety has said it can’t: Provide information on what role federal agents have played during the state’s multimillion-dollar border surge. Senate Votes to End Renewable Energy Programs, by Jim Malewitz — The Senate on Tuesday approved legislation that would close the book on two programs that helped fuel the state’s years-long surge in wind energy production. Uber, Lyft Back in House Headlights, by Ryan McCrimmon — Another round of sparring between Texas cities and car service companies Lyft and Uber played out on Tuesday, when a panel of Texas lawmakers considered letting cities regulate Lyft and Uber the same way they regulate cab companies. Texas Senate Approves $211 Billion Budget, by Matthew Watkins — Senators on Tuesday voted 30-1 to approve the state's two-year budget. It will now go to conference committee to be reconciled with the House version. Rubio Looks to Texas for Campaign Cash, by Patrick Svitek — U.S. Sen. Marco Rubio, who announced Monday he is running for president, is heading to Texas to raise money. Open Carry Bill Derailed on Texas House Floor, by Morgan Smith and Ryan McCrimmon — After a point of order was raised Tuesday over a technical error in how witness testimony was recorded, open carry legislation was sent back to the House Homeland Security and Public Safety Committee. • The House convenes at 10 a.m.; the Senate convenes at 11 a.m.
• House Higher Education meets at 8 a.m. where they will take up a proposal related to the Hazlewood Act, which provides for a certain amount of free tuition for veterans and their dependents (E2.014). • House State Affairs meets on final adjournment where one bill up for consideration would strengthen protections for a pregnant patient's advance directive and do-not-resuscitate order. The bill was drafted in honor of Marlise Muñoz, the pregnant Fort Worth woman who in 2013 was kept on life support against her family’s wishes (JHR 140). • Tea party groups from across the state rally at noon on the south steps of the Capitol in what is being called the first-ever statewide Tea Party rally. Participants will lobby lawmakers afterward. • Gov. Greg Abbott will hold a 1 p.m. press conference at a North Austin business to highlight his plan to reduce the business franchise tax. "The legislative process is pretty cool, but it would be hard for me to do this for very long." 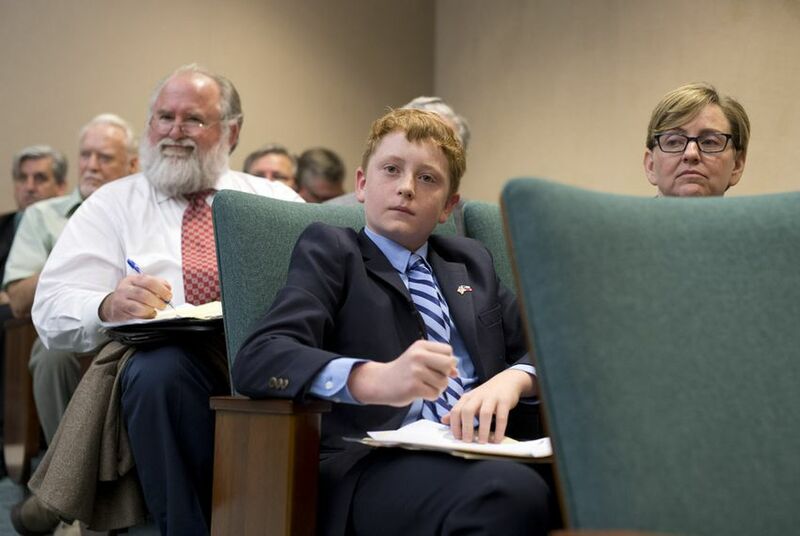 — Jacob Hale, a 13-year-old student from Austin, who was testifying in favor of a bill offered by state Rep. Donna Howard, D-Austin, that would change the name of Confederate Heroes Day to Civil War Remembrance Day. Hale came up with the idea for the legislation after studying Texas' role in the Civil War. Why I defended Confederate flag license plates, by Jim George — Friends, family and former associates have demanded to know why I, a protégé of the Supreme Court’s first African-American justice, would go to bat for Confederate flag license plates before the U.S. Supreme Court. My answer is simple.